This episode of the Vital Vegas Podcast is so full of Las Vegas, it may need a fresh pair of Spanx. 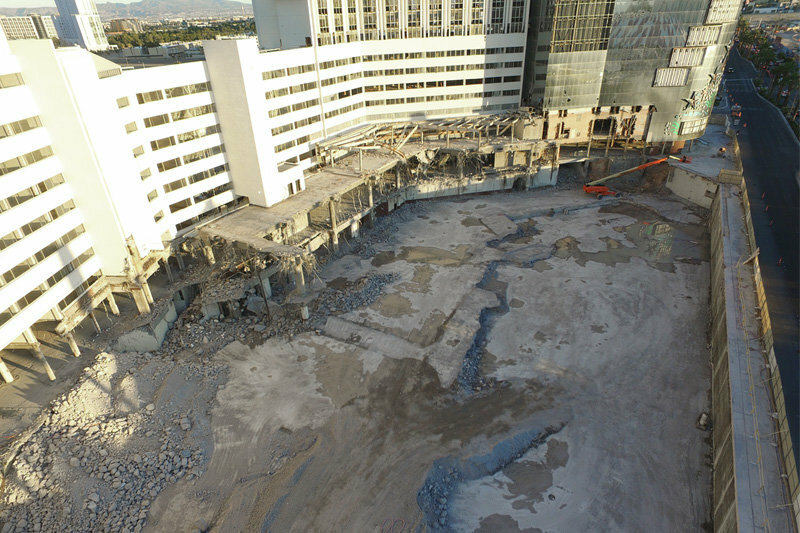 First, we share our boundless disappointment in “Jason Bourne,” filmed partly in Las Vegas. 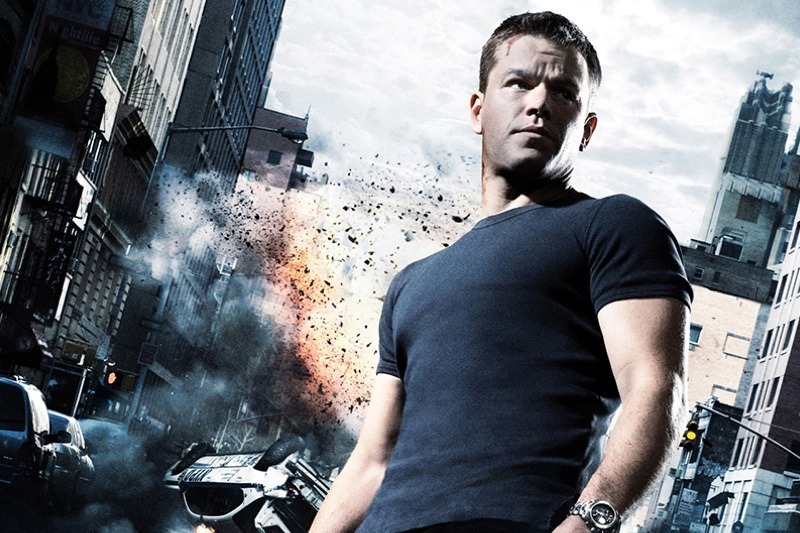 This ridiculous cavalcade of “meh” is by far the worst installment of the Bourne film series, and we’re even including that awful Jeremy Renner one nobody went to see. Even a flashy Strip chase can’t save this hot mess. 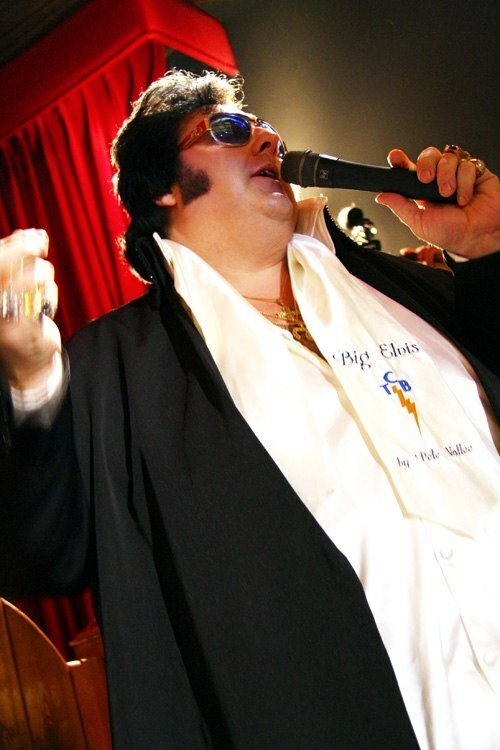 We’ve also got an interview with a Las Vegas legend, Pete “Big Elvis” Vallee. Vallee was a fixture at Barbary Coast and Bill’s Gamblin’ Hall, and his show continues to draw legions of fans at Harrah’s Las Vegas. Vallee talks about his Las Vegas journey, challenges with his health (including a death-defying car accident in 2015) and an upcoming honor. In October, he’ll join such Las Vegas luminaries as Wayne Newton, Liberace, Dean Martin, Frank Sinatra and Elvis Presley as a recipient of a star on the Las Vegas Walk of Stars. Pete “Big Elvis” Vallee hangs out after his free shows to schmooze with fans. He’s got a heart as big as his talent. 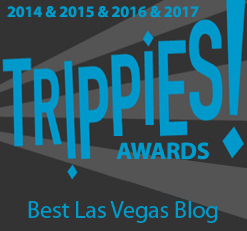 Of course, we give our slightly inebriated take on all the latest Las Vegas news, and share a metric hell-ton of exclusives, because that’s how we roll. Test your ability to endure the mediocre and take a listen. 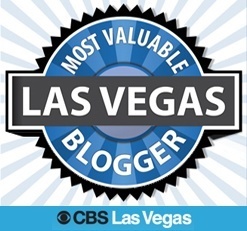 This entry was posted in Las Vegas, Vital Vegas Podcast on July 30, 2016 by Scott Roeben. The date’s been set, and the classic Riviera isn’t long for this world. 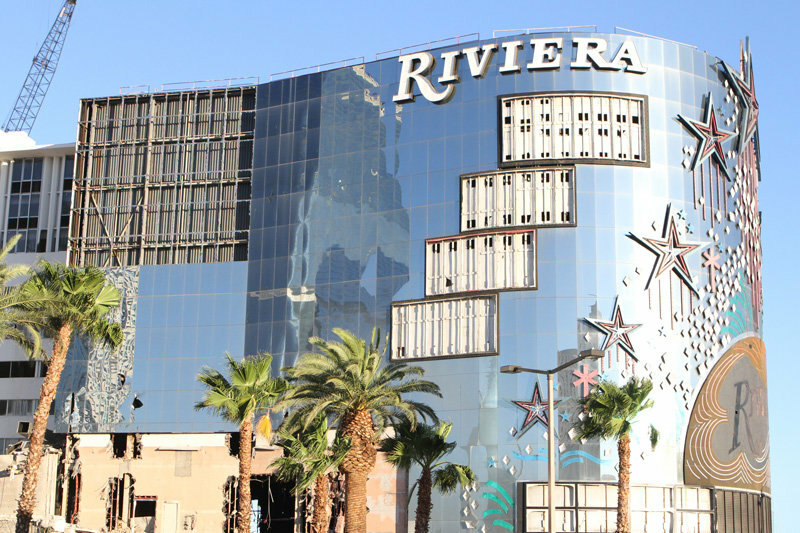 Two of Riviera’s remaining structures, the Monte Carlo Tower (not to be confused with the Monte Carlo hotel) and South Tower are set to be imploded on August 16, 2016, at 2:00 a.m. Previously, it was thought just the Monte Carlo would be imploded, but it appears the South Tower is tool tall for the demolition equipment to handle, so that one’s getting all blowed up, too. 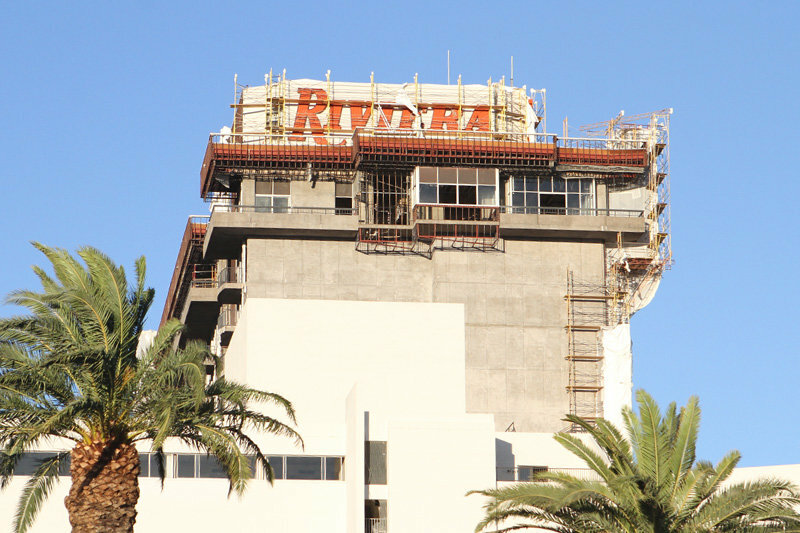 The Riviera on July 26, 2016. The Monte Carlo is that taller one in the back. 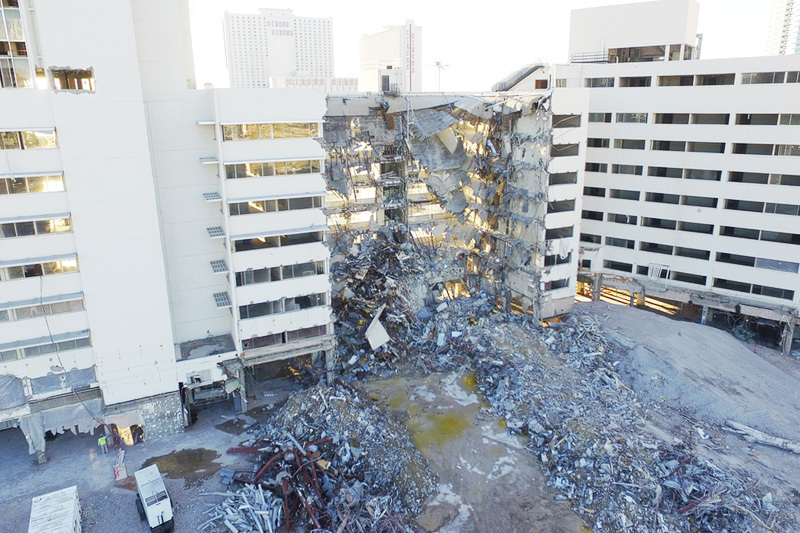 Our friends at Vegas Bright first floated the possible date of the implosion, and now it’s been confirmed, thanks to a notice distributed to nearby residents. 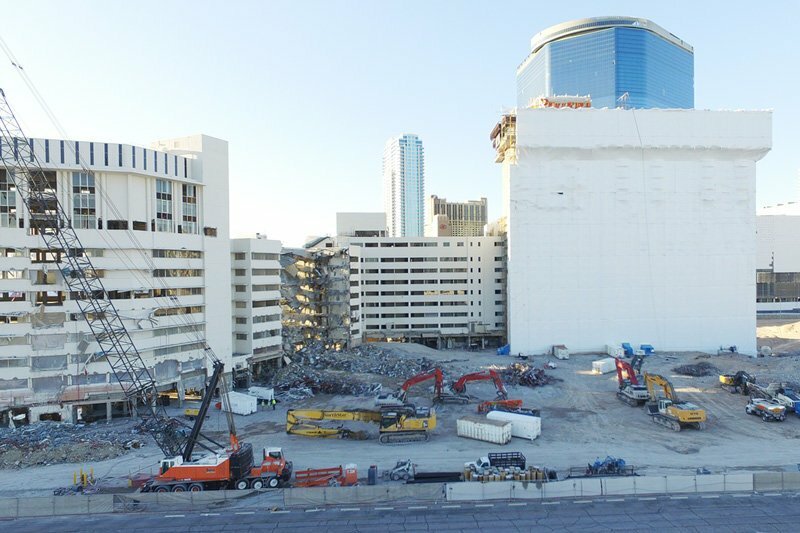 The notice was shared by someone nearly as obsessive about the Riviera’s demise as we are, Austin Shepard, the person we’re rooting for in the creation of a Las Vegas Casino Museum. 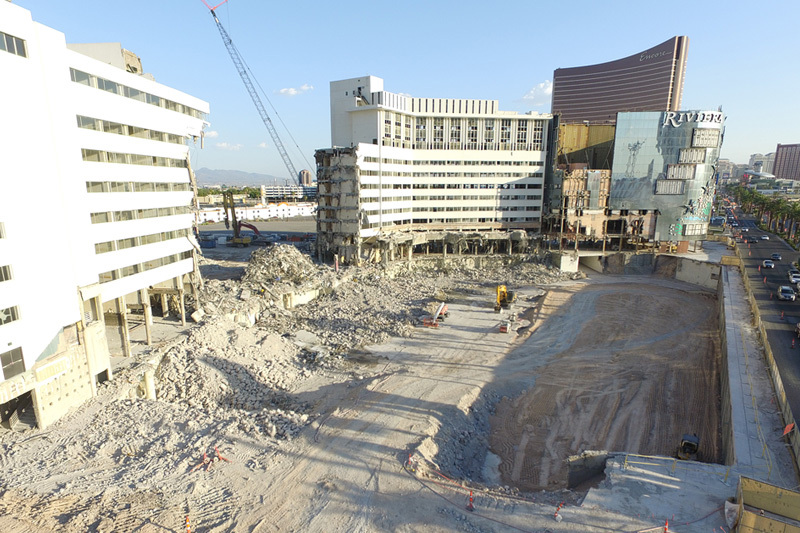 The implosion in the early morning hours of August 16 (or, if you prefer, the late hours of August 15) should be accompanied by the requisite amount of hoopla, although no specifics have been given by the owner of the site, the Las Vegas Visitors and Convention Authority. 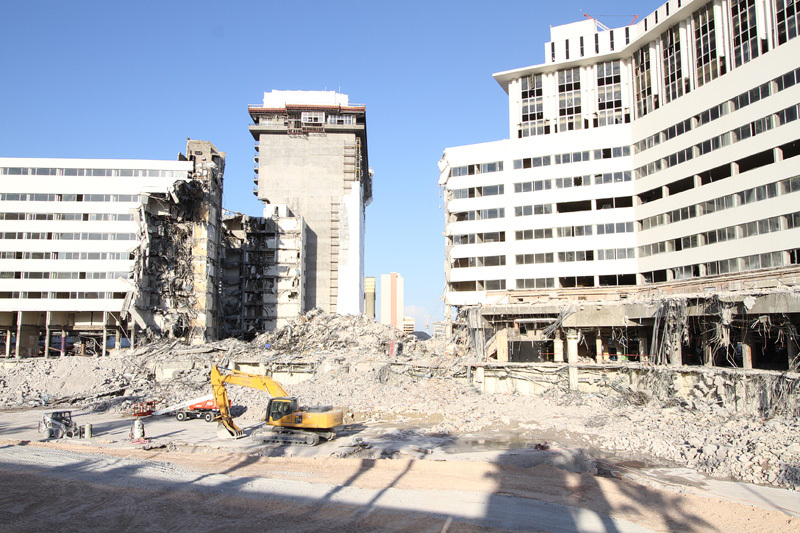 Demolition crews are making quick work of the few remaining low-rise buildings at the Riviera site, and the Monte Carlo Tower and South Tower may be the only structures standing by the time it’s imploded. Remember that casino in the movie “Casino” and that abandoned rooftop pool and that underground parking? Now, not so much. 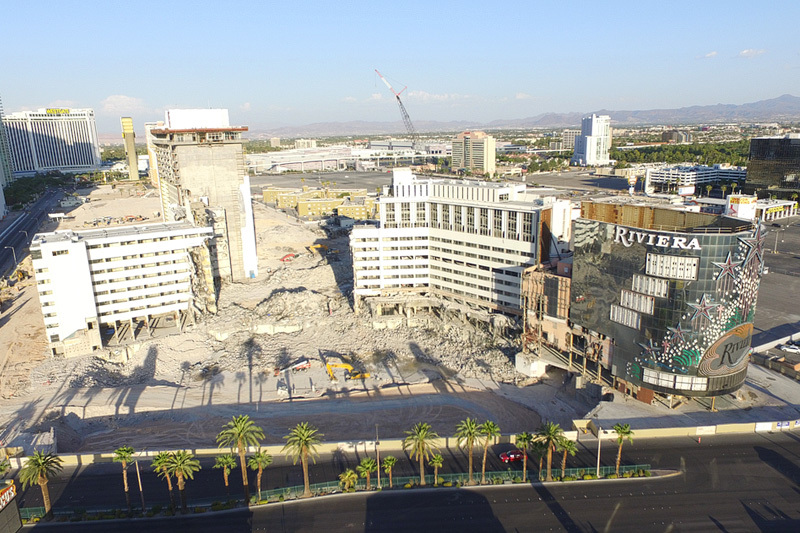 Soon, even the Riviera’s mirrored facade, with some of the most distinctive, old-school neon in Las Vegas will be a memory. 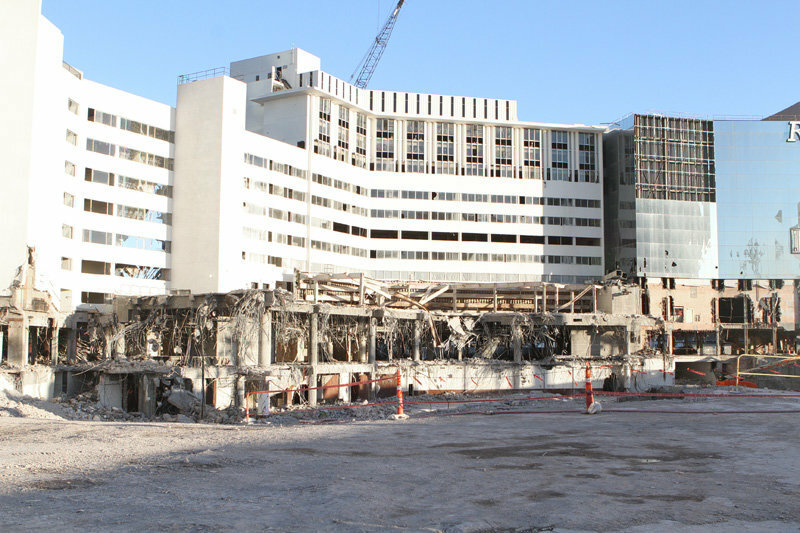 Stop by and bid the old girl farewell while you can. 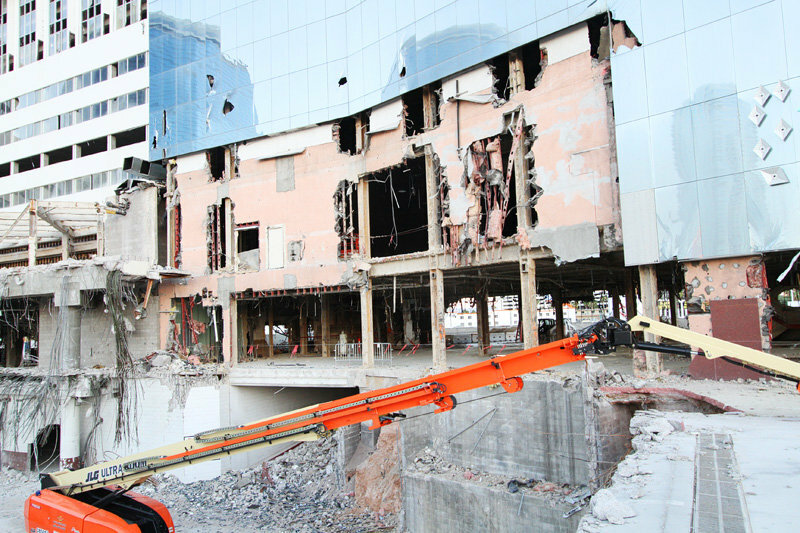 This entry was posted in Las Vegas, Las Vegas Casinos, Las Vegas Hotels, Riviera Demolition on July 30, 2016 by Scott Roeben. “Jason Bourne” is finally here! The newest chapter in the Jason Bourne saga (opening July 29, 2016) includes an eye-popping chase sequence on the Las Vegas Strip, but what very few know is it almost didn’t happen. Why? To put it generously, asshattery. but you get our drift. The chase begins [SPOILER ALERT] at a faux technology conference at Aria, called Exocon. Bad guy Vincent Cassel assassinates an ubernerd played by Riz Ahmed, and flees in a SWAT vehicle. Bourne gives chase in a black Dodge Charger and all hell breaks loose. 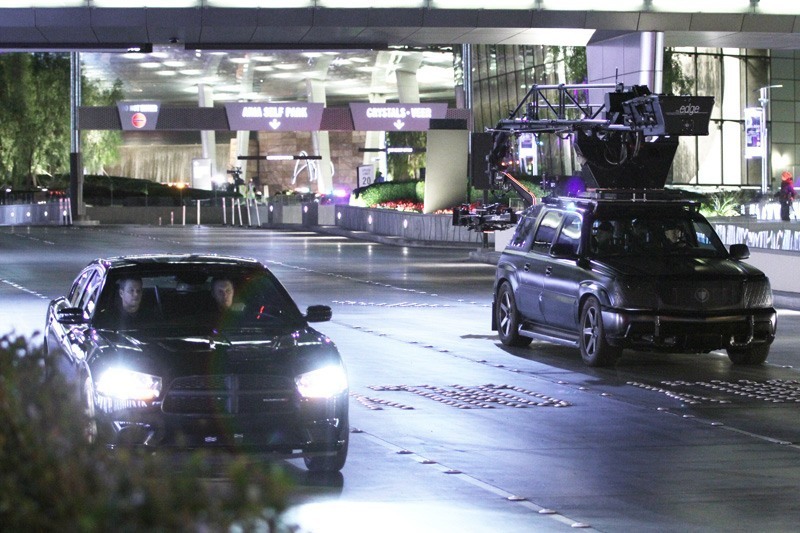 Matt Damon (in the passenger seat) took the wheel from his stunt driver for portions of the big chase, including this sequence at Aria. 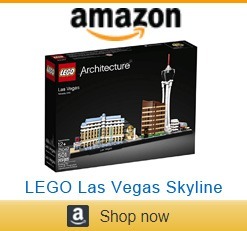 cooperation from several Las Vegas resorts and Clark County, where The Strip resides. As the shoot grew near, though, something unthinkable happened. On Dec. 20, 2015, an unstable, 24-year-old woman named Lakeisha Holloway drove into the sidewalk outside Planet Hollywood and Paris Las Vegas and rammed three dozen pedestrians, killing one of them. The incident was shocking, tragic and pointless. And it happened just two weeks before production of “Jason Bourne” was to start in Las Vegas. 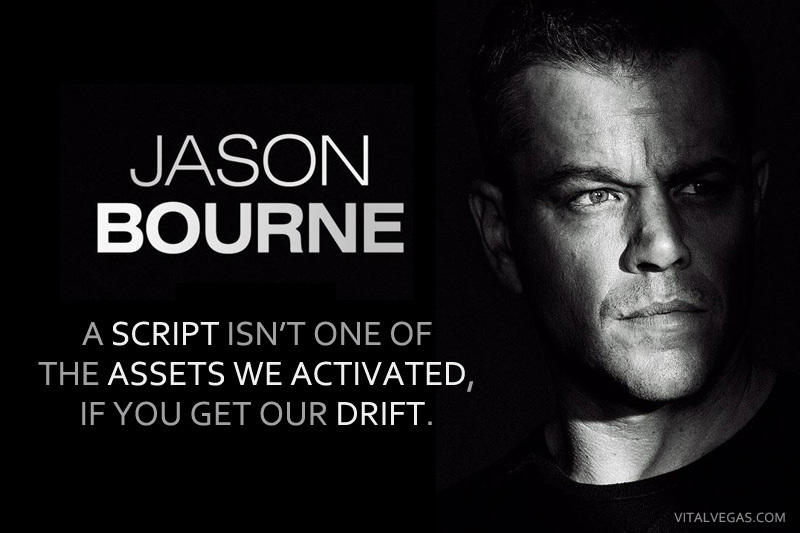 Fact: Jason Bourne has no patience for asshattery. See, the chase on The Strip wasn’t just close to where the accident happened, it was precisely where the accident happened. median, it crosses at exactly the point where Lakeisha Holloway began her rampage, on the sidewalk in front of Planet Hollywood. Her crime continued down the front of Paris Las Vegas, with its easily accessible sidewalk (no visible safety measures have been added since the accident, so stay vigilant), and Jason Bourne’s car takes the same route. At one point, Bourne’s car even runs up onto the sidewalk. See more in the B-roll. Eerie coincidence, to say the least. running and screaming, on The Strip. Especially on that stretch of road. Some wondered if the sequence should be scrapped, out of respect for the victims. Alternative locations were floated. The filmmakers waited and watched, with many millions of dollars in production costs in the balance. Filming in Las Vegas began as scheduled, first at the airport, then at a bus station in downtown Las Vegas. 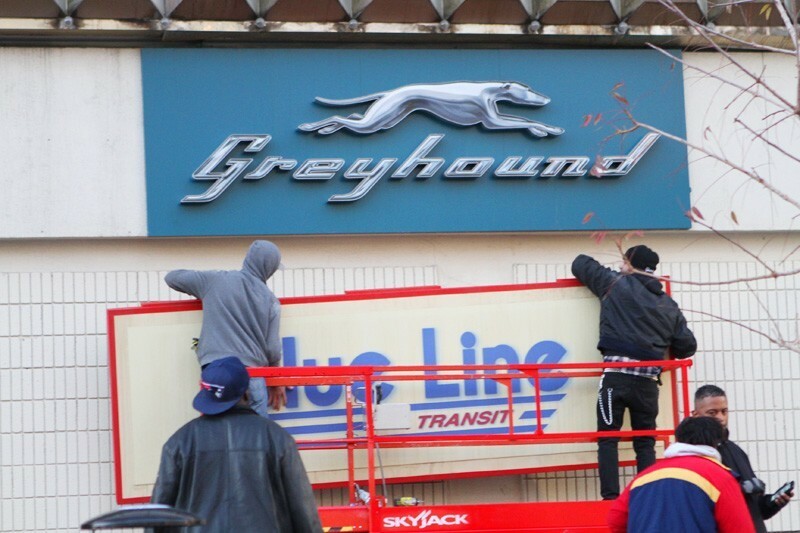 For scenes at the bus depot, Greyhound signs were covered with signs reading Blue Line. Movie magic. As the days passed, the production team decided it would proceed as planned with the chase on The Strip. 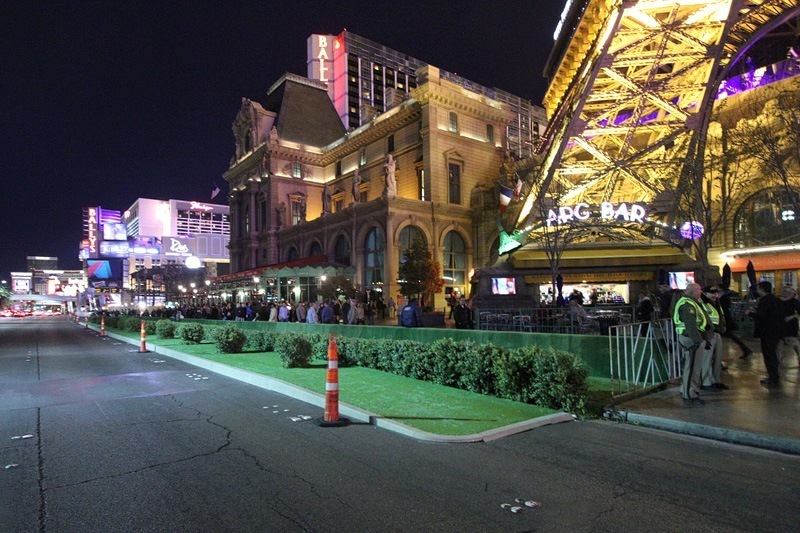 Filmmakers built an extension to the sidewalk in front of Paris Las Vegas, complete with faux grass and shrubbery, probably an attempt to alter the appearance of the area where the tragedy took place. Shrubbery serves as camouflage outside Paris. The rest is cinematic history, as they say. See more of our exclusive skinny about the “Jason Bourne” production in Las Vegas. measure to how fast and how hard” we’d have railed about the fact that if you give into terror tactics, the asshats have won. In this case, audiences around the world won. In other words, all the things Jason Bourne isn’t. Take that, asshats. This entry was posted in Jason Bourne Las Vegas, Las Vegas on July 28, 2016 by Scott Roeben. The rumor mill is on tilt this week in Las Vegas, and we’ve wrangled some of the juiciest tidbits to share in a completely irresponsible fashion, because that’s how we drunk blog, baby. Here’s how it falls out. For starters, the Fertitta brothers (also referred to as Lorenzo and Frank), sold the UFC for $4 billion. Not too shabby for a $2 million investment back in 2001. The sale of the UFC has resulted in the Fertitta brothers moving from bajillionaire status to multi-bajillionaire status. It’s a great gig if you can get it. To be more specific, Forbes says the Fertitta brothers are worth a combined $3.2 billion. 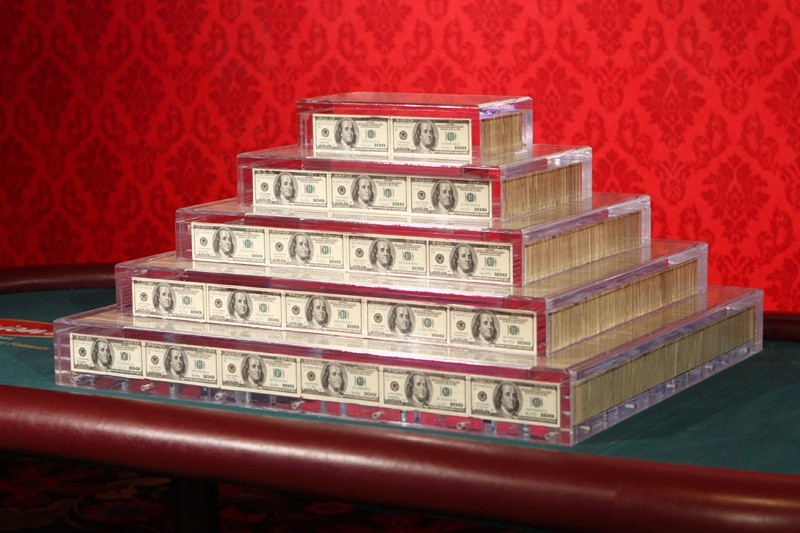 That’s not Sheldon Adelson money, but it’ll do in a pinch. Since the UFC sale, each brother’s wealth has climbed to $2.4 billion each. In case you’re keeping score, a billion is a thousand millions. And this may not even take into account the bajillions the Fertitta brothers made when their Red Rock Resorts, Inc. (a/k/a Stations Casinos) went public. Each of the brothers is believed to have received more than $110 million for that little transaction. So, what is one to do with all these billions? Make more billions, of course! The Fertitta brothers are going to purchase all or part of the Las Vegas Raiders. Yes, the Raiders are coming to Las Vegas, despite our best efforts. In case you haven’t been keeping up with the whole Raiders drama, the current owner of the Raiders has said he’s willing to move the team if Las Vegas can pony up with a stadium. A surprising number of NFL team owners are now onboard with having a team in Las Vegas, despite years of resistance related to concerns about people (GASP!) gambling on sports. The 100-acres in and around the Wild Wild West casino. 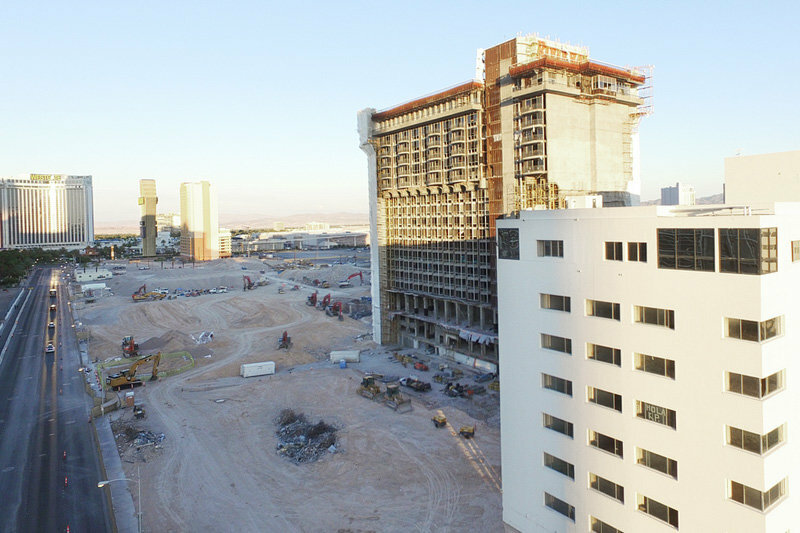 The Wild Wild West casino is about a half-mile west of the I-15, close enough to The Strip to be a viable location, without many of the headaches (including traffic and parking) associated with the T-Mobile Arena. 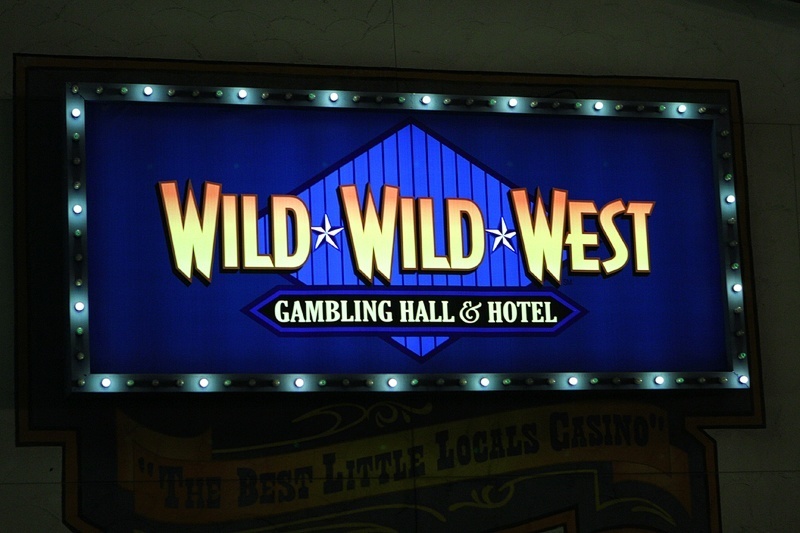 We once frequented the Wild Wild West casino, but close down your craps table and you’re dead to us. The Wild Wild West site is owned by the aforementioned Fertitta brothers and their Red Rock Resorts Inc. Even people who know what they’re talking about agree the Wild Wild West space is the leading contender for the new 65,000-seat domed football stadium. The stadium would probably be a public-private partnership between the Fertittas (Stations Casinos), Las Vegas Sands Inc., Majestic Realty and the Raiders (no matter who owns it when the deal is inked). Yes, there are still lots of financial wrinkles to be hammered out. Cost estimates for the stadium have risen to $2.1 billion, with about $750 million in public funding needed. The “public funding” would presumably come from a room tax. We are not personally interested in the “details” or “facts” surrounding this whole Raiders thing. We are more interested in another spectacular rumor we’re starting right this very minute. 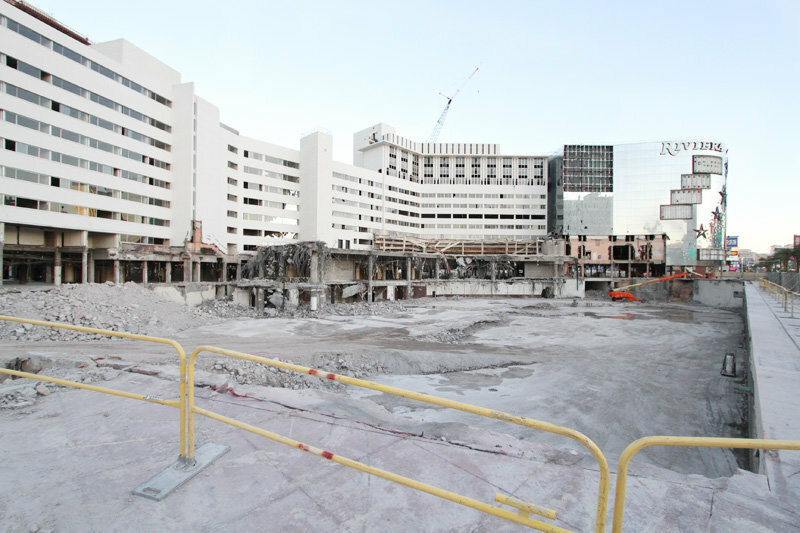 Because from what we understand, it’s those very same Fertitta brothers who are the mysterious buyers of the (wait for it, again) Fontainebleau hotel! 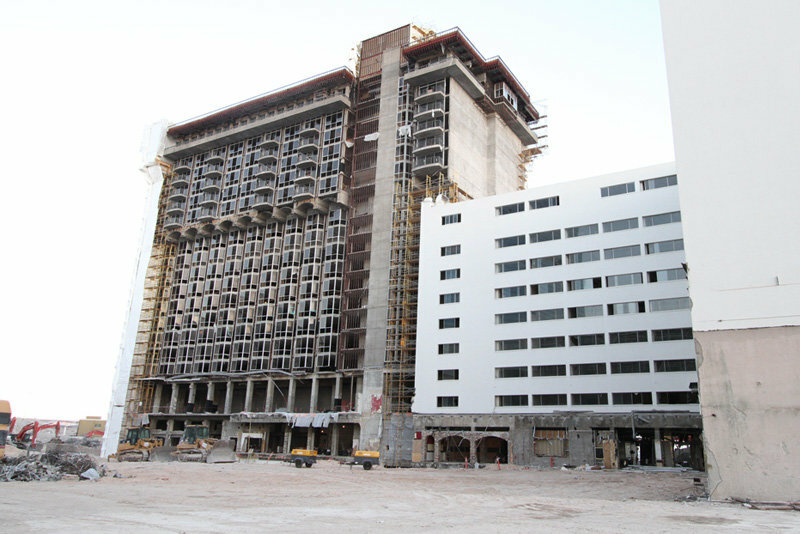 We checked with a source at the real estate company handling the Fontainebleau and our theory was nixed: Station has denied “having any interest in the Fontainebleau.” That’ll teach us to drunk post. 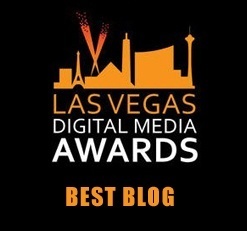 Other than that, is all this the ramblings of an intoxicated Las Vegas blog? Probably. But if you can find holes in any part of this delicious web of unsubstantiated rumors, we’d love to have you poke them. Or something. Let’s hear your version of how all this unfolds. Especially if you agree with us. If not, keep it to yourself. This entry was posted in Las Vegas on July 25, 2016 by Scott Roeben. Downtown’s Gold Spike has closed its cafe, The Grill, and is working on a new restaurant concept, Fiddlestix. 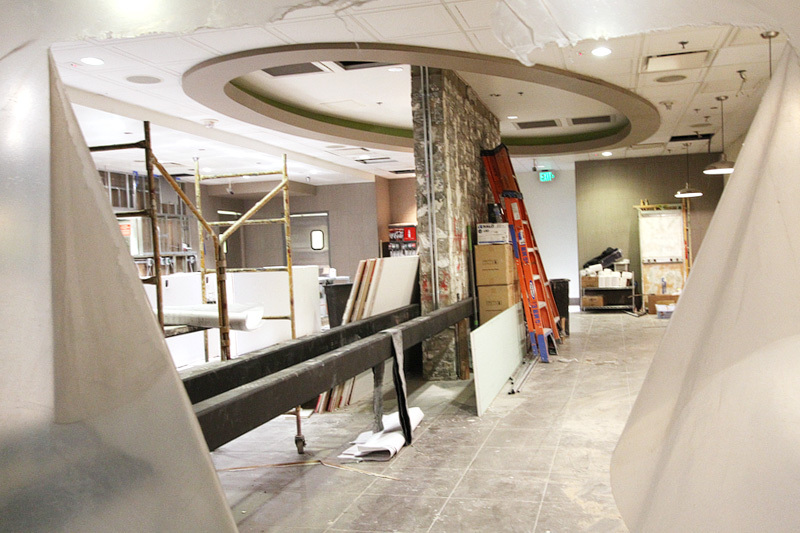 The new restaurant is expected to open in early August 2016. The restaurant concept is, refreshingly, not part of an existing chain. Fiddlestix will feature a variety of breakfast favorites, salads, burgers, sandwiches and alcoholic milkshakes. Especially that last thing. Fiddlestix will also offer breakfast items 24 hours a day, including lighter options like granola and muesli, as well as other things this blog has never personally eaten. Breakfast offerings will include bagels and “schmears,” pastries, eggs and specialty items like bacon and eggs toast with Fontina cream sauce, smoked salmon toast and cornflake-crusted French toast with Jack Daniels maple bourbon syrup. Especially that last thing. It’s curtains for The Grill at Gold Spike. From 6:00 a.m. to 10:00 a.m. daily, Fiddlestix will offer build-your-own yogurt parfaits and acai bowls. On Saturdays and Sundays, from 9:00 a.m. to 2:00 p.m., brunch will be available with a specialty menu and all-you-can-drink mimosas and Bellinis. And especially that last thing. As for the aforementiond alcoholic milkshakes, they’ll include The Dude (vodka, Kahlua, vanilla ice cream), Cereal Milk (RumChata cream liqueur, Fireball whisky, vanilla ice cream, Cinnamon Toast Crunch), Irish Breakfast (Jameson Irish Whiskey, crispy bacon, crumbled pancake, vanilla ice cream, maple syrup) and Oh Captain, My Captain (Captain Morgan spiced rum, Cap’n Crunch cereal, vanilla ice cream). 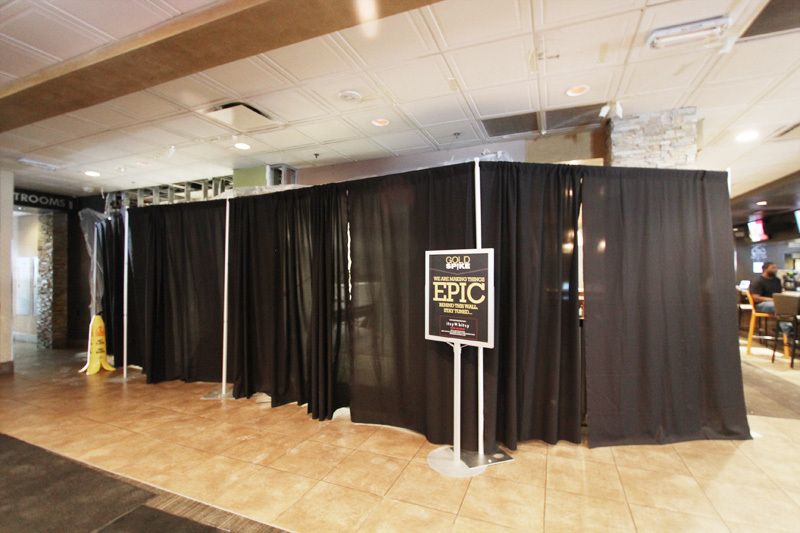 Gold Spike’s interior design pixies are wasting no time in revamping the restaurant. Insert Pixy Stix joke here. Fiddlestix will seat 50 people, and the center of the room will boast a 20-seat floating fuchsia quartz community table with interactive built-in iPads and Internet access. It’s a Millennial thing. Fiddlestix will be open 24 hours a day. Gold Spike, of course, has become the surprise hit of downtown. 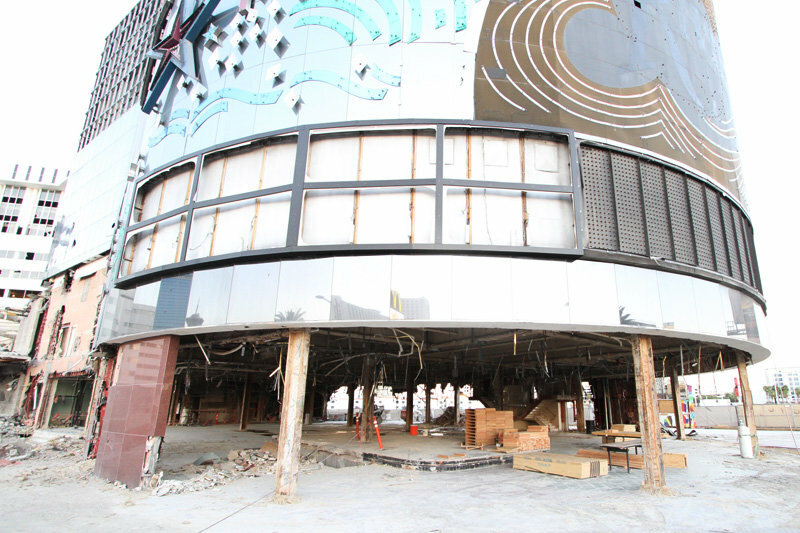 It was formerly an underwhelming casino, but was purchased by Zappos CEO Tony Hsieh and the Downtown Project. There’s also the Oasis at Gold Spike, and it’s adorable. 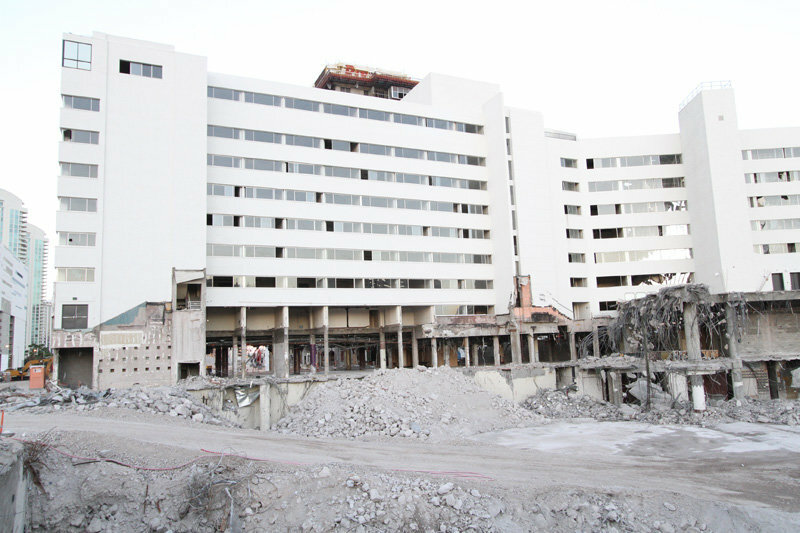 The Gold Spike’s casino closed on April 14, 2013. Usually, that’s where this blog’s interest would end, but on May 6, 2013, Gold Spike re-opened as a bar, restaurant and nightlife party spot. Gold Spike originally opened as Rendezvous in 1976. The Living Room. 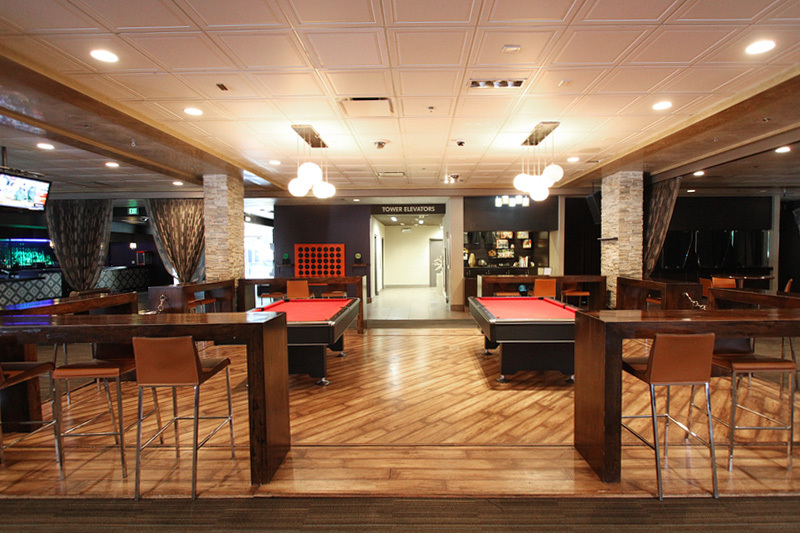 What’s not to love about dueling pool tables? Gold Spike provides a refreshing change from the usual downtown haunts and is about the only place in Las Vegas where corn hole, giant Jenga and board games are offered without it feeling like a feeble ploy to get hipsters to gamble. 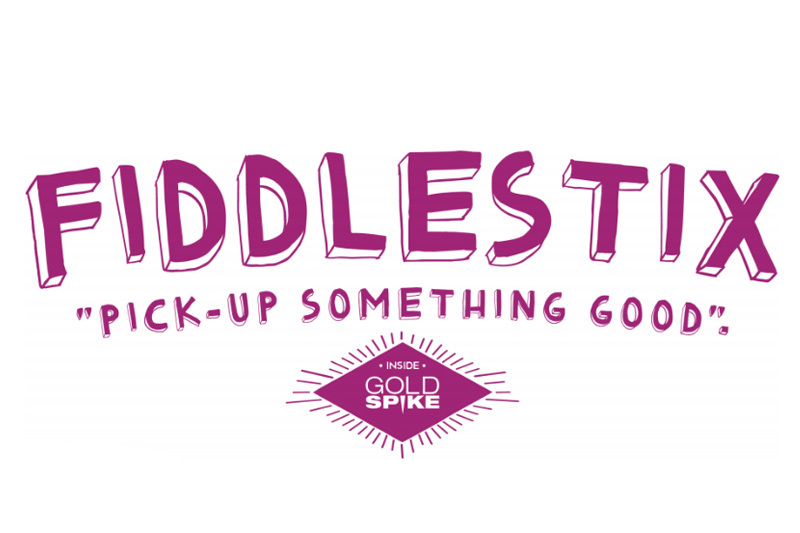 There’s no question Gold Spike knows its customers, so we expect Fiddlestix will serve up accessible, hearty options at a fair price. We predict it will soon be in our regular lunch rotation. This entry was posted in Downtown Las Vegas, Las Vegas, Las Vegas Bars, Las Vegas Restaurants, Security Breaches on July 22, 2016 by Scott Roeben. ninth. Oh, just pick an analogy, already. No matter how you say it, the Riv’s days are numbered. This part of the Riviera is newly translucent. 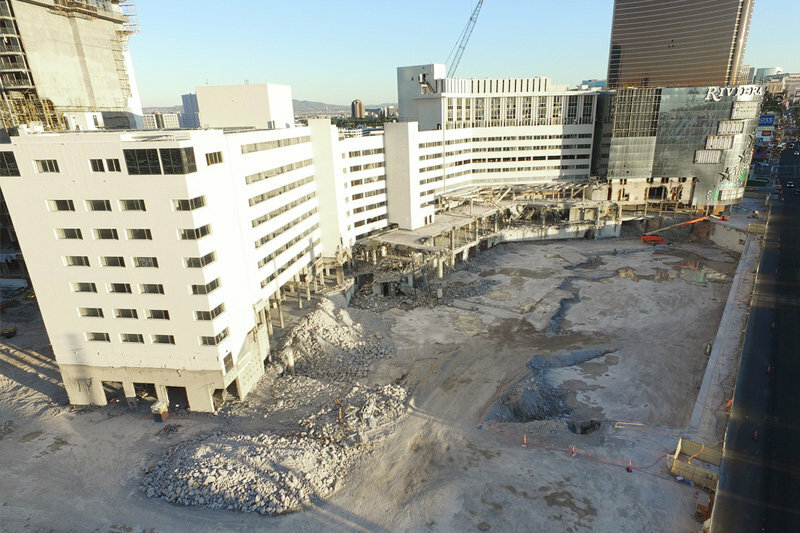 Here’s the best view you’re likely to get of the dissection of a Las Vegas legend. 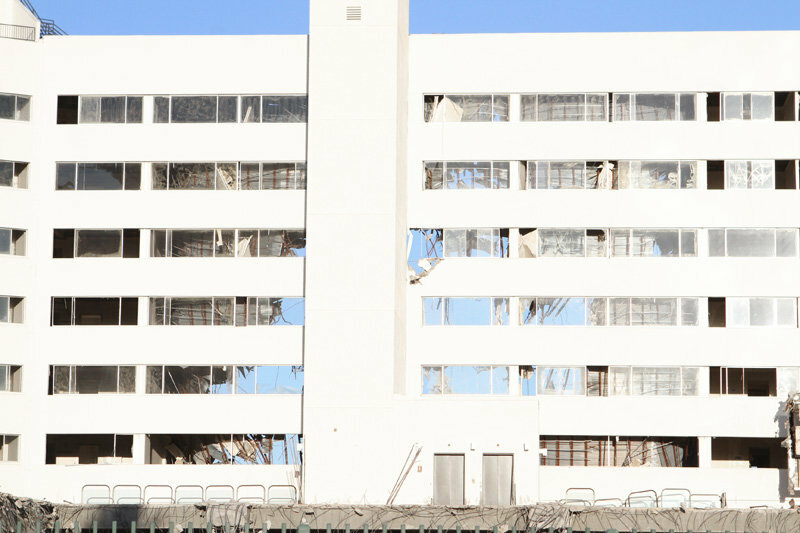 The Monte Carlo tower has undergone some durmabrasion to remove its asbestos-rich stucco. 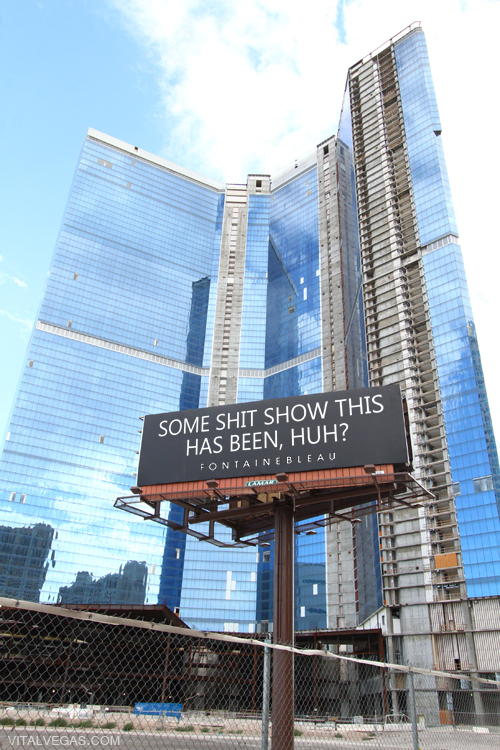 This should make the tower’s dust cloud safer during its upcoming implosion. Sounds legit. 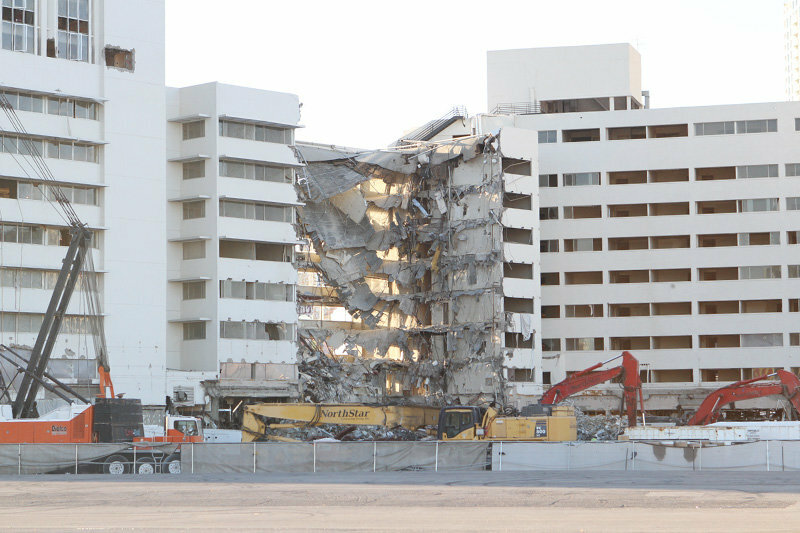 hotel’s tallest tower, the Monaco, was imploded on June 14, 2016. 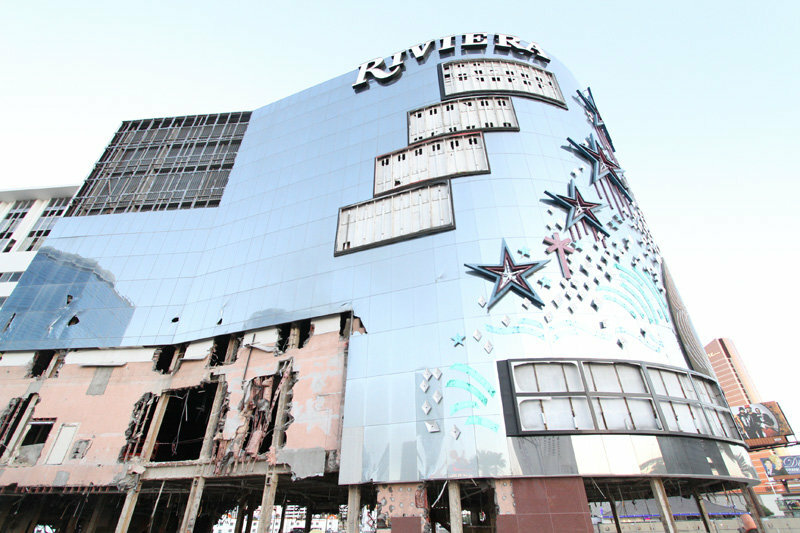 The demolition has even found its way to the Riviera’s famed facade. This is the part where we get a little weepy. complete in a few weeks. 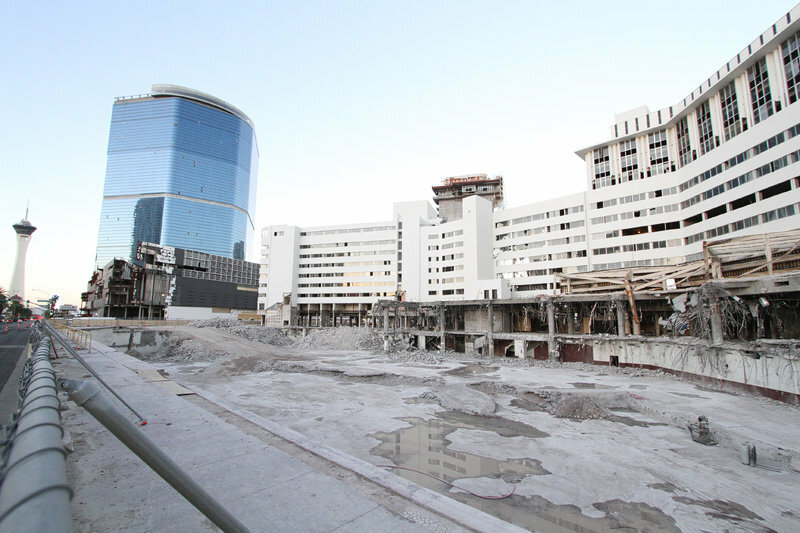 That patch of dirt used to be the hotel’s abandoned pool, casino and underground parking lot. (wait for it) spectacular climax. constant in Las Vegas is change. And our puerile jokes. But mostly that first thing. 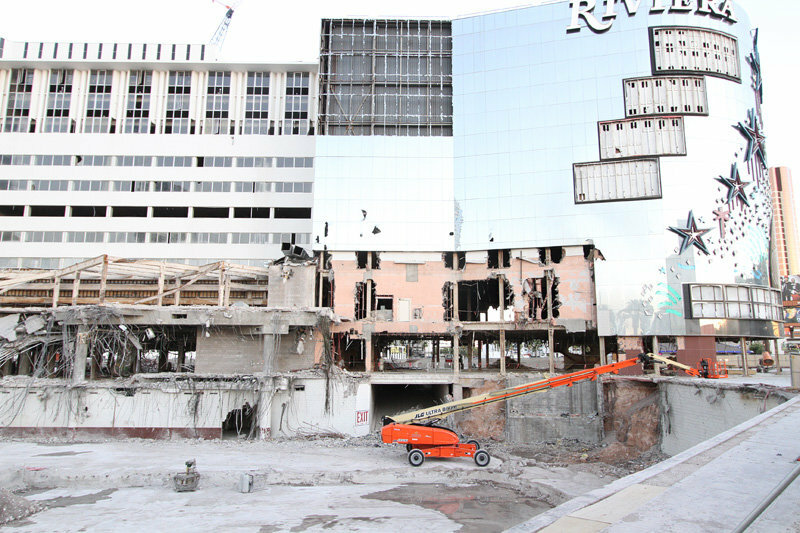 This entry was posted in Las Vegas, Las Vegas Hotels, Riviera Demolition on July 21, 2016 by Scott Roeben.